The authors have no disclosure relevant to this article. Although uncommon and less frequent than knee or hip periprosthetic infection , periprosthetic shoulder infection (PSI) remains a devastating complication and, despite treatment, is associated with unsatisfactory results . The reported incidence of infection following primary anatomic total shoulder arthroplasty ranges between 0.4% and 2.9%, with higher rates are estimated after revision surgery [8-10]. The incidence of infection after primary reverse total shoulder arthroplasthy is around 5%, considerably higher than after anatomic shoulder arthroplasty and comparable to knee or hip replacement . The elevated infection rate for reverse total shoulder arthroplasty can be explained by the abundant dead space associated with the reverse configuration of the joint. In addition, in the absence of rotator cuff, the implant is not surrounded and protected by living tissue and is, therefore, more susceptible to bacterial colonization . Early detection and a successful treatment can help to stop the development of long-term infection and significant impairment of bone and soft tissue . A delay in diagnosing a PSI can result in long-term pain, prosthetic instability, and, sometimes, sepsis. Diagnosis derives from the integration of clinical symptoms, laboratory exams, radiological studies and microbiological swabs. However, diagnosing a PSI is not always easy, as symptoms may be minimal. Moreover, the inactive disposition of common shoulder pathogens can hinder the diagnosis of shoulder pathogens such as Propionibacterium acnes. The clinical presentation of PSI is generally nonspecific. The most frequent symptom is pain; other clinical signs of infection may be lacking. The existence of a sinus tract that connects with the prosthesis is definitive proof of PSI (Figure 1). Another local sign that may be found is erythema, while systemic symptoms (fever, chills) are less common . Figure 1. A draining sinus tract in the medial aspect of the deltopectoral surgical incision. The Infectious Diseases Society of America recommend considering that a patient may have a periprosthetic infection in the presence of “an acute onset of a painful prosthesis, or any chronic painful prosthesis at any time after prosthesis implantation, especially when there are no pain-free periods, in the first few years following implantation or if there is a history of prior wound healing problems” . Note that treatment using non-steroidal anti-inflammatory medications and oral antibiotics can impede a correct diagnosis . The WBC count in a deep infection is seldom abnormal, while the ESR and CRP level are frequently elevated [7,19,28]. Nevertheless, the ESR and CRP level are specific markers of inflammation and could be unremarkable in cases of P. acnes infection . Moreover, both markers are normally higher following an uncomplicated surgical operation. The ESR will fall gradually, while the CRP level will diminish faster, typically returning to normal levels within 2 weeks of a routine operation. Topolski et al  described the value of preoperative studies and intraoperative histology in patients who underwent revision shoulder replacement and had positive intraoperative cultures. In a series of 75 shoulders without obvious signs of infection undergoing revision, the preoperative WBC count was normal in 67 of 72, with normal polymorphonuclear cell distributions and a normal ESR in most patients. Among the 16 patients who had a CRP measured, it was normal in 12. The intraoperative histology showed no signs of acute inflammation in 67 of 73 patients. The authors concluded that there were no reliable intra- or preoperative studies to forecast who was likely to have a positive intraoperative culture. With early infection, radiographic findings are typically normal. Radiographs may, however, provide important clues in subacute and chronic infections. Lucent lines, which develop within a few months, strongly signal an infection (Figure 2). Other subtle radiologic findings include the presence of medial calcar erosion and resorption of the tuberosities. Figure 2. Radiograph of a shoulder 1 year after hemiarthroplasty. Note a lucent periprosthetic line at the bone-prosthesis interface with signs of loosening. Ultrasonography may be useful in identifying localized fluid accumulation, as some PSI could present with fluid collections that can be traced to remote locations from the glenohumeral joint . 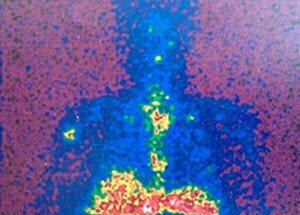 Technetium Tc-99 bone scans and indium In-111–labeled white blood cell scintigraphy should be taken into account when the diagnosis of PSI continues to be in doubt. (Figure 3) . Figure 3. Labeled leukocyte scintigraphy revealing an increased uptake localized in the proximal periprosthetic zone of the humerus. All patients with a suspected PSI should have a diagnostic arthrocentesis, except in cases in which the diagnosis is clinically obvious and surgery is planned. Withholding antibiotic treatment for a minimum of 2 weeks before the arthrocentesis enhances the chances of retrieving an organism. The synovial fluid analysis should include a total cell count and differential leukocyte count, along with culture for aerobic and anaerobic organisms. A WBC count of >50,000 cells/mm3 with more than 75% polymorphonuclear cells or even direct germ visualization are suggestive of infection. Intraoperative histopathologic examination of periprosthetic tissue samples is a proven diagnostic test, provided that a skilled pathologist specialized in the evaluation of periposthetic tissue is available to analyze the sample. It should be carried out during the surgery, if the presence of infection is in question, based on the clinical judgment of the surgeon and the results are needed to determine the choice of treatment. More than 5 polymorphonuclear leukocytes per high-powered field signify infection when they are found in a minimum of 2 tissue specimens. Withholding antibiotic treatment for a minimum of 2 weeks before collecting intraoperative culture enhances the chances of retrieving an organism. For the same reason, perioperative antibiotics should be withheld until tissue samples are obtained . Implant sonication is a recent technique that involves the removal of the prosthesis and putting it into a solid container that is then vortexed and sonicated. The technique can be used to identify germs in the biofilm clinging to the prosthesis. Implant sonication has proven to be more sensitive than intraoperative tissue specimens for identification of bacteria, especially P. acnes, although it has yet to obtain extensive acceptance . Vincenzo Franceschini is from the Department of Orthopaedics and Traumatology, Sapienza University of Rome, Latina, Italy. Claudio Chillemi is from the Department of Orthopaedics and Traumatology, Istituto Chirurgico Ortopedico Traumatologico Latina, Italy. Excerpted from: Franceschini V, Chillemi C. Periprosthetic shoulder infection. The Open Orthopaedics Journal, 2013, 7, (Suppl 2: M10) 243-249. © Franceschini and Chillemi; Licensee Bentham Open. This is an open access article licensed under the terms of the Creative Commons Attribution Non-Commercial License (http://creativecommons.org/licenses/by-nc/3.0/) which permits unrestricted, non-commercial use, distribution and reproduction in any medium, provided the work is properly cited. Fehringer EV, Mikuls TR, Michaud KD, Henderson WG, O’Dell JR. Shoulder arthroplasties have fewer complications than hip or knee arthroplasties in US veterans. Clin Orthop Relat Res 2010; 468(3): 717–22. Coste JS, Reig S, Trojani C, Berg M, Walch G, Boileau P. The management of infection in arthroplasty of the shoulder. J Bone Joint Surg Br 2004; 86(1): 65-69. Jerosch J, Schneppenheim M. Management of infected shoulder replacement. Arch Orthop Trauma Surg 2003; 123(5): 209-14. Boileau P, Sinnerton RJ, Chuinard C, Walch G. Arthroplasty of the shoulder. J Bone Joint Surg Br 2006; 88(5): 562-75. Cheung EV, Sperling JW, Cofield RH. Infection associated with hematoma formation after shoulder arthroplasty. Clin Orthop Relat Res 2008; 466: 1363-7. 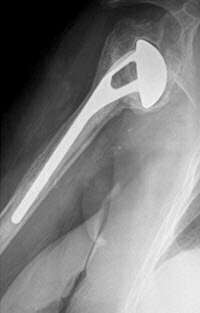 Farshad M, Gerber C. Reverse total shoulder arthroplasty-from the most to the least common complication. Int Orthop 2010; 34(8): 1075-82.
de Cupis V, Chillemi C, Marinelli M. Grammont inverted prosthesis for the treatment of cuff tear arthropathy: a 6-year follow-up study. Orthopedics 2008; 31(5): 447. Sabesan VJ, Ho JC, Kovacevic D, Iannotti JP. Two-stage reimplantation for treating prosthetic shoulder infections. Clin Orthop Relat Res 2011; 469(9): 2538-43. Saltzman MD, Marecek GS, Edwards SL, Kalainov DM. 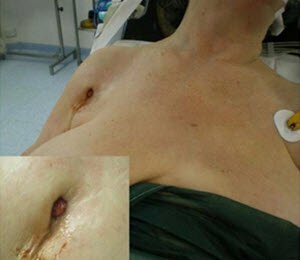 Infection after shoulder surgery. J Am Acad Orthop Surg 2011; 19(4): 208-18. Osmon DR, Berbari EF, Berendt AR et al. Diagnosis and management of prosthetic joint infection: clinical practice guidelines by the infectious diseases society of america. Clin Infect Dis 2013; 56(1): e1-e25. Matsen FA 3rd, Rockwood CA Jr, Wirth MA, Lippitt SB, Parsons M. Glenohumeral arthritis and its management. In: Rockwood CA Jr, Matsen FA 3rd, Wirth MA, Lippitt SB, Eds. The Shoulder. 3rded. Philadelphia: WB Saunders 2004. Wirth MA, Rockwood CA Jr. Complications of total shoulder-replacement arthroplasty. J Bone Joint Surg Am 1996; 78(4): 603-16. Themistocleous G, Zalavras C, Stine I, Zachos V, Itamura J. Prolonged implantation of an antibiotic cement spacer for management of shoulder sepsis in compromised patients. J Shoulder Elbow Surg 2007; 16(6): 701-5. Dodson CC, Craig EV, Cordasco FA, et al. Propionibacterium acnes infection after shoulder arthroplasty: a diagnostic challenge. J Shoulder Elbow Surg 2010; 19(2): 303-7. Topolski MS, Chin PY, Sperling JW, Cofield RH. Revision shoulder arthroplasty with positive intraoperative cultures: the value of preoperative studies and intraoperative histology. J Shoulder Elbow Surg 2006; 15(4): 402–6. Potter HG, Schweitzer ME, Altchek DW. Advanced imaging in orthopaedics: current pitfalls and new applications. Instr Course Lect 1997; 46: 521-9. Portillo ME, Salvadó M, Sorli L et al. Multiplex PCR of sonication fluid accurately differentiates between prosthetic joint infection and aseptic failure. J Infect 2012; 65(6): 541-8.